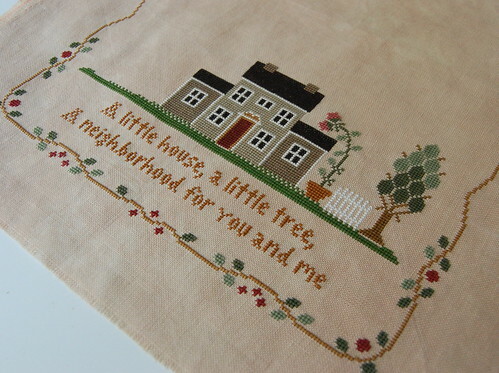 Nicole's Needlework: Little House Neighborhood Nightmare! Great! You are doing very well already it LHN SAL with a picture. Very nice. I did not start it unfortunately yet. The threads and it are substances selected already. Yet PIF I have debts, but I will be ready shortly. And I start. Oh, that's a nightmare for sure! Beautiful piece of work! Your LHN house is sooooooooooo pretty! I just love the colors in that one and your stitching is so uniform and pretty too! I am glad that was just a dream you had. It sounds like my experience with the roof of my house on mine as I frogged several times. The fabric was almost like your dream but I was able to fix it all. I love your new stash! Maybe I should order from her as my LNS never has these new things in for about a month after everyone else does. Do these new all dolled up patterns come with the buttons and beads or do you have to get them seperately? I love them and especially the strawberry house. HAHA, I received the same exact order yesterday from Amy! She is the best! I think you should start all 3, at least choose some fabric and do a 3 piece rotation over the course of 2 weeks, I bet you could get all 3 done! You're a very fast and detailed stitcher. A true inspiration to us bloggers. It is looking so good. OK I have a question. If you had to pick only one LH project to do or to do over which one would it be? That would definitely be a scary dream, Nicole. I’m glad it was just a dream! You are making such great progress on your Little House Neighborhood! 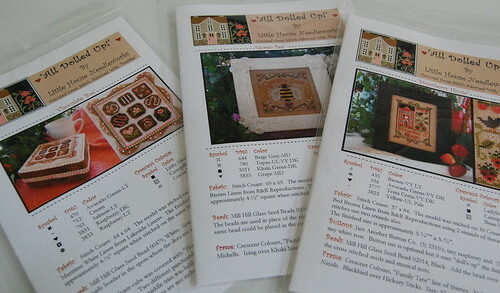 Those new LHN charts are so cute – I really like the strawberry house one, but the bee is pretty cute, too! Yikes! I'd be freaking too! Your project is looking awesome. And congrats on the stash enhancement. I'm waiting for mine to come in too! Enjoy your stitching.. it's looking great! your piece looks fantastic!!!!! Glad your dream was just that...a dream/nightmare. That would be awful! Look at those beautiful charts! PS: I had a great time seeing you, Nicole. And I can testify that your stitching is more beautiful in person than on your blog!! OMG what a nightmare! Your progress on it is wonderful. You're doing a great job with it. Can't wait to see your next progress picture. glad it was only a dream! OMG! That really was a nightmare!!! It's looking great! That certainly was a nightmare. Glad to see your LHNeighborhood in one piece and looking terrific! New stash, you lucky thing. I'm going through stash withdrawals at the moment. Just hanging out to have a big spend-up after my holiday. Love all the Dolled Up charts. BTW - I liked Deb's interpretation of your nightmare. Start the strawberry house! My favorite! Funny (not ha-ha funny) about your nightmare. Mine's always spilling something dark on it that puts a big stain on the fabric. Don't even want to analyze that one. I also want to let you know that I have been a regular reader of your blog for quite a while now, I am just a bit shy leaving comments. I find a lot of inspiration and enabling every time I visit here. I have nominated you for the Kreativ Blogger award. Oh, what an awful nightmare! Glad it was just a nightmare. Your LHN SAL is looking wonderful. I've stitched the border on mine and am just finishing up all the leaves. That IS a nightmare! Glad it was only a dream!!! Congrats on your finish! It looks great.